Rowan-Salisbury is excited to begin its fourth year of their 1-to-1 initiative where all students in grades 3-12 receive a mobile device to use for instructional purposes. This is an exciting time as all our devices will be refreshed meaning that students will have the newest iPad available to use this year. View the Parent/Student Information Video: This video may be viewed at home in advance or you may come to the school to view the video. The link to the video is https://www.youtube.com/watch?v=ru8xKkGTd3w&feature=youtu.be. Please note that YouTube is blocked on RSS Wifi. Responsible Use Policy (RUP) signed by both parent/guardian and student. This form must be returned to the school. Paper copies of the RUP will be available at the school as well. User fee payment of $20 received. This payment can be made in cash (no checks) directly at the school. This fee can also be paid with a credit card online at https://osp.osmsinc.com/rss//default.aspx. You will need your student's powerschool number in order to pay online with a credit card. Once the three steps are completed, students will be eligible to receive an iPad to bring home for use throughout the year. Rowan-Salisbury Schools is pleased to offer the convenience of using a credit card to pay for the user fee. If you need help with the online payment options, view this screencast. (Please note that this screencast shows you how to use the online payment system but was made previously using a different technology usage fee. The correct fee of $20 will be reflected in this year's online check out). You will need your student's PowerSchool Number as well as your credit card information available. If you have any questions, please contact your school's technology facilitator. Remember to print out a copy of your receipt. The school will automatically receive notice of your payment but having a receipt, just in case, is always a good practice. The Responsible Use Policy describes Rowan-Salisbury Schools expectations for use of technology. All parents and students are encouraged to read this policy after viewing the Parent Training Video. 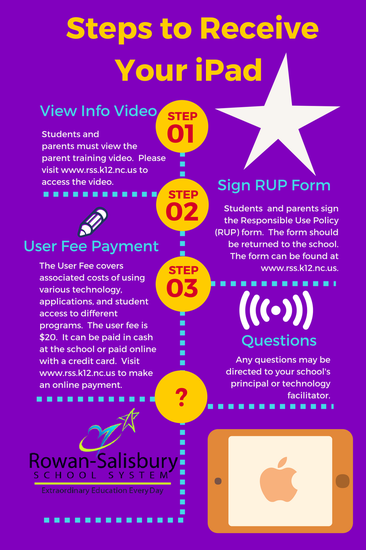 Once the video has been viewed and the RUP read, the student and parent should sign the Responsible User Policy (RUP) Signature Page and return it to school. For those unable to print out the RUP Signature Page, copies are available at the school. Any questions regarding the RUP should be directed to either the school's principal or technology facilitator. Rowan-Salisbury Schools has created a document that describes the estimated cost of repairs / equipment damage as a guide to help students and parents. This list is an estimate and prices are subject to change. Also some damage or repairs may fall outside of this list. Any damages or cost of repairs will be invoiced to students for payment.